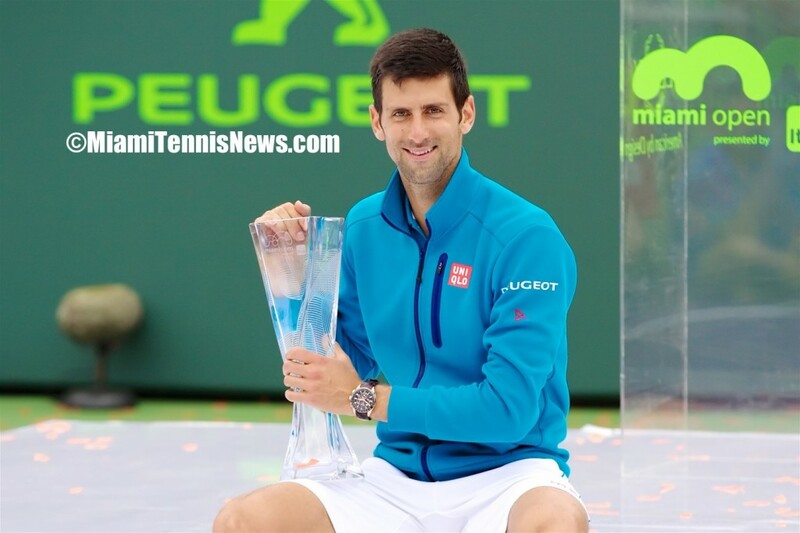 Tag Archive | "Boris Becker"
Novak Djokovic pulled off a three-peat at the Miami Open and won the tournament for the sixth time in his career by defeating Kei Nishikori 6-3, 6-3 on Sunday afternoon. Djokovic got off to a relatively slow start and dropped serve twice in the first set but ended up cruising to the title in one hour and 26 minutes. Nishikori broke right away at love for a quick 1-0 advantage in the opener only to give it right back. The world No. 1 soon found himself trailing by a break before earning another scalp of the Djokovic serve at 2-4. A somewhat bizarre first set saw Nishikori win eight return points–all of which came in two love service breaks. Djokovic held his other three service games at love. Set two was more straightforward, with the top-seeded Serb surrendering only four points on serve. Two breaks were more than enough for Djokovic, who coasted to the finish line as Nishikori began struggling with an apparent knee problem. “I thought he started very well breaking my serve in the first game and coming out with some big forehands and aggressive play,” the champion reflected. “I needed to answer right back, which I did in the following game…which helped me mentally to kind of continue the match in a right way. Because if you’re a break down, 2-0 down, things are a little bit different, obviously–especially against a player like Kei. In triumphing, Djokovic gained sole possession of the all-time lead in Masters 1000 titles with 28. He also surpassed Boris Becker for 11th place on the all-time ATP Open Era victories list with 714. Additionally, Djokovic moved past Roger Federer for No. 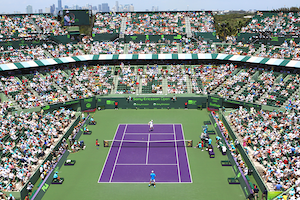 1 on the career prize money chart and completed the Indian Wells-Miami double for a record fourth time. Ricky Dimon is a contributor to MiamiTennisNews and writes for tenngrand.com. You can follow him on Twitter under @Dimonator by clicking here. Three time Sony Open Tennis champion Novak Djokovic met with the press in Miami prior to his first round match on Friday. Djokovic revealed that his coach Boris Becker will not be in Miami as he is undergoing surgery on both of his hips. Djokovic responded to questions regarding the resurgence of Roger Federer, Andy Murray splitting with Ivan Lendl and the future of Juan Martin Del Potro. Q. Can you tell us a little bit about Boris. We hear that he’s been unable to travel. NOVAK DJOKOVIC: Yes, he’s unable to travel. He has surgery of his both hips today and tomorrow, so that’s unfortunate. He couldn’t come. Q. But was that expected? NOVAK DJOKOVIC: No, he was supposed to come here. Basically in the finals of Indian Wells he called us and said that he had an emergency and he has to operate both hips. Q. How will this affect or will it affect you and Boris going forward? NOVAK DJOKOVIC: No, no, he’s going to be in MonteCarlo, and the schedule for the tournaments that he committed before the start of the season, he will be there, you know, unless his health doesn’t allow him. Of course, in these particular situations you can’t do much about it. If he has to operate his hips, he cannot move, cannot walk, unfortunately. It’s been something that it’s kind of an issue that has been issue he’s been carrying for many years already. If he is able, he’s going to be in MonteCarlo already. Everything stays the same. Q. People will look at what you did in Indian Wells and say, Well, you didn’t miss Boris much, but I guess what he has done in the buildup contributed to that success. NOVAK DJOKOVIC: Yeah, absolutely. Well, first of all, I mean, Boris is a head coach, and this was not only my own decision. It was actually Marian’s proposal from the start, because as I was saying before, he has been on the tour as a player and coach 30 years. It’s been a very long time for him. He wanted to spend more time with his family, and it was time for me to kind of try to get somebody that is able to commit for more tournaments than Marian. So when Marian was still around, as you see, it was planned for him to be in Indian Wells; now he’s in Miami because of this situation. But they split tournaments. I mean, Boris is supposed to travel to more tournaments. They have a very good communication and relationship, and I’m happy with the way it all has started. Obviously the start of the season I haven’t won Australian Open as it was the case in last, previous three years, but, you know, it’s a sport. I feel that I’m playing good on the court. It’s just a matter of time when things are going to click. I’m glad that I already they already have clicked in Indian Wells. I have had a great two weeks, and the benefits and the effects of our incorporation, Boris and mine, hopefully we will see in the rest of the season. Q. I wanted to ask you about Roger’s resurgence. You just played him, and some people had already just not counted him out or were starting to write him off the Big 4 and all that. Can you talk about him and just having played him. What do you see in his game different, and that he’s sort of back? NOVAK DJOKOVIC: Yes. Well, I think he’s playing in a high level this year. He’s back to his normal level, you know, the level that he had for seven, eight years while he was so dominant in men’s tennis. Obviously last season he was not as good for his standards. You know, but this year he started strong. He won the title in Dubai and played semis of Australian Open. I can feel that he’s striking the ball very cleanly. He’s very confident on the court and he has improved his backhand I think. Maybe it’s the racquet or something else, but he definitely has more depth on that shot. He’s going more for his topspins rather than slicing it. You know, of course, with his immense experience and success that he had in his career, he’s never to be ruled out. Doesn’t matter how old he is. It’s just a number. As he was saying, he feels good on the court. He’s fit. He’s definitely one of the best players in the world now. Q. Were you as surprised as we were about Andy Murray’s split with Ivan Lendl? NOVAK DJOKOVIC: Well, to be honest, I was not surprised. But, again, I didn’t know what to expect. They worked for two years, and obviously it brought both of them, especially Andy, a lot of success on the court. He won Olympic Games, won a few Grand Slams. I think it was a very good decision from inside to be working with Ivan. Now they split. I mean, they obviously had a good reason for that. I’m not the one who should judge. NOVAK DJOKOVIC: Maybe. But I was saying that that was not the motivation behind me hiring Boris Becker. As I said before, it was a kind of a course in our relationship between Marian and myself where, you know, we came to the point where we had to think of an alternative option. We had to think about somebody stepping into our team. That was the main reason why we hired Boris. Q. How important is playing with this environment in Miami? Different for all of you? NOVAK DJOKOVIC: It is different tournament. It’s actually one of the nicest ones we have on tour. It’s a lot of fun, a lot of entertainment, very international crowd. I have had much success in this city before I won my first big title back in 2007. I remember here was my first Masters 1000 event. So I have really good memories. I always look forward coming back to Miami this time of the year. It’s nice weather. As I said, a lot of fun on and off the court. Q. Now that a couple of days has passed since Indian Wells, how much of a boost is that for you confidencewise and a bit of a relief? I know winning titles is nothing new to you, but an estrangement at the start of this year. How much of a confidence boost is that for you? NOVAK DJOKOVIC: Well, it is, in some kind, a relief for me, because I haven’t had a title this year up to Indian Wells. Indian Wells final was the first final of the year. I haven’t played many tournaments; I haven’t played many matches. So I knew I’m playing well. I had incredible end of 2013, so I did have confidence. But I started a little bit doubting myself on the court. You know, I was struggling a little bit with my, I would say, consistency and the concentration. Throughout the tournament also I had ups and downs, but I managed to win four out of six matches in three sets. Mentally it’s a very encouraging win that gives me confidence and that also, you know, is very special in a way. This time of the year I needed it very much, and hopefully I can carry that into this week. Q. Juan Martin Del Potro, have you talked to him, about his future? NOVAK DJOKOVIC: Well, I talked to him a little bit a few days ago. He was uncertain if he’s going to play or not. Now he’s not playing, so, yeah, it’s really unfortunate. I think it’s the other wrist, because he had problems with one wrist and now it’s the other one. He’s a very tall, tall guy, and for him playing many tournaments in a high level week in and week out is very difficult. His body is suffering, and it’s unfortunate that somebody of his quality is not performing here. Also Indian Wells. Tennis definitely misses him. He’s always one of the contenders to win big titles. He’s very entertaining to watch. He’s a nice guy. I wish him all the best and quick recovery. Q. We’re doing a story on fashion in tennis, and we have seen it transcend, you know, Agassi with the denim shorts. You had the Darth Vader look. A, what is your inspiration when you go into designing your own clothes? And, B, how important is it for all of you guys to differentiate you guys with your style? NOVAK DJOKOVIC: Yes, well, you mentioned Andre Agassi. I mean, he definitely revolutionalized the fashion in tennis. He was the first one to dress differently and to have some kind of statement on the court. Well, I have been through a process in my career, as well. I had different dragons and wings on my shirts (smiling). But I’m at a different stage right now. Of course I’m very much involved in giving trying to give my input as much as I can to design my own clothes. I’m fortunate to have a really good team of people and designers from Uniqlo Company who represents me the last two years. There is various, I will say, inspirations behind the certain designs for different periods of the year depending on color of the surface, depending on the time of the year, depending where we go, color of Serbian flags, so forth and so forth. So there are different sources of inspiration we are trying to put into the design and kind of create something that looks nice on the court. Today, Roger Federer claimed his fifth year-end ATP finals title with a superlative performance over a defiant, but defeated world number one, Rafael Nadal, 6-3, 3-6, 6-1. In the 22nd meeting of an illustrious rivalry that will leave a great legacy for the game for years to come, Nadal and Federer captivated audiences world-wide with a final that sparkled with explosive shot making, drama and as many twists and turns as a Shakespeare play. The world number one and two are polar opposites with one thing in common; an extraordinary will to win. While many began to question Federer’s mental strength following his failure to capitalize on two match points against an often mentally fragile Novak Djokovic in the semi-finals of the US Open earlier in the year, Federer seemed to have shrugged off any niggling doubts of his own authority in matches in the run up to the final. Questions have also been raised about Nadal’s physical problems. A shoulder injury in his serving arm caused Nadal to take a five week break before the ATP Finals and his recurring knee problems are always a concern. Many wondered how Nadal’s body would cope after a grueling three set match against Britain’s Andy Murray in the semi-finals. The tennis world waited with baited breath to see how the latest act in tennis’ greatest rivalry since Andre Agassi and Pete Sampras would play out. In the opening set, Nadal described Federer as “unplayable” and it was evident from the outset that the Swiss Maestro was back to his absolute best. The players went tactically toe to toe until the seventh game when Nadal’s continued tactic of playing to Federer’s backhand backfired spectacularly. With a superb cross court winner from that wing, Federer gained the break of serve. Then, the former world number one closed out the first set 6-3 with a forehand winner in just 32 minutes. But, with a dramatic swing of momentum, like an incensed lion released from its cage, Nadal characteristically pounced on Federer’s drop in form in the second set. By switching tactics, Nadal secured a break of serve in the fourth game through working the Federer forehand with spectacular success. Federer took a tumble in the fifth game following an unkind net cord for Nadal and so did his form, allowing the Spaniard to pull ahead with a comfortable 4-1 lead. The remainder of the second set went with serve. Nadal held his nerve after losing the first point when serving out the set at 5-3 by finishing Federer off with a wonderfully executed backhand slice right at the master’s feet. Game on. Following his Australian Open victory in February, Roger Federer’s game had been in a tailspin. In his best form since Melbourne, Federer made the final at the Rogers Cup last week, but went down to Andy Murray. However, today, Federer edged out wildcard Mardy Fish 6-7,7-6,6-4 at the Western and Southern Financial Group Masters for his second straight Western and Southern Financial Group Masters title and his 17th Masters’ shield. This hardcourt season, Fish has positioned himself as a man to fear. After a grass title in Newport, Fish claimed the initial trophy of the Olympus U.S. Open series in Atlanta. In Cincinnati the first three rounds, Fish dismissed Gilles Simon, 9th seed Fernando Verdasco and Richard Gasquet in straight sets. Subsequently, in the quarterfinals, Fish defeated Andy Murray for the third consecutive time. Then, in the semifinals, Fish collected his second successive win over Andy Roddick by erasing a 4-6,2-5 deficit and improved his record to 16-1 since Wimbledon. Thus, with these results, Fish’s confidence was astronomical. Moreover, with Fish in the most outstanding physical shape of his career and an easy triumph over Federer in their last meeting at Indian Wells in 2008, the chances were excellent that in his fourth attempt, Fish would gain his first Masters’ shield. Conversely, despite advancing to two other finals besides Toronto, Federer was denied in Madrid and Halle this year. In his 90th career final, Federer was hungrier than ever to capture his 63rd career title and gain momentum heading into the U.S. Open. Subsequent to a comfortable hold by each player, Fish got embroiled in a 15 minute plus game. After surviving two break points, on the ninth deuce, Fish obtained a game point with a backhand volley winner and sealed the game with a strong serve for 2-1. Thereafter, both men cruised on serve until the tenth game when Fish misfired on a forehand up the line to give Federer set point. With an ace, Fish wiped out Federer’s advantage and later tied the set at 5 all. At 5-6 on Fish’s serve, Federer arrived again at set point when Fish’s stroke hit the net and flew long. Once more, Fish repelled his opponent and forced a tiebreaker. On Federer’s backhand crosscourt error, Fish got a mini-break for 4-3. But, with two forehand winners, Federer stole both points off Fish’s serve for 5-4. Still, Fish reversed the tides with an overhead winner and a backhand error by Federer to fabricate set point at 6-5. With Federer unable to catch up to Fish’s serve, the American bagged the tiebreaker. Yet to face a break point, Federer continued to coast on serve in the second set. However, Fish had no problem matching the defending champion. In fact, Fish’s first serve percentage improved as the set progressed. At two all, Fish pushed Federer to a deuce game. But, Federer guarded serve to stay ahead 3-2. After holding at love for 6-5, Federer got to deuce on Fish’s watch with a forehand up the line winner. By readily finding his first serve, Fish held for a second tiebreaker. With a forehand crosscourt winner, Federer inched ahead with a mini-break for 2-0. After stretching his lead to 4-1, Federer provoked two errors from Fish to take command of the tiebreaker at 6-1. Next with an ace, Federer leveled the match at one set a piece and forced a decisive set.